I haven't seen anyone's build up of this kit on the forum so here is my latest effort. It's of resin construction in 1:72 scale. The kit is pretty basic, almost like an updated version of the 1970's era vacuform kits(remember them?) There was a lot of scratch building with this model and for the price there should have been some directions, decals, and a stand. But it's the only game in town and I've wanted one of these "egg beaters" in my collection for a over decade. 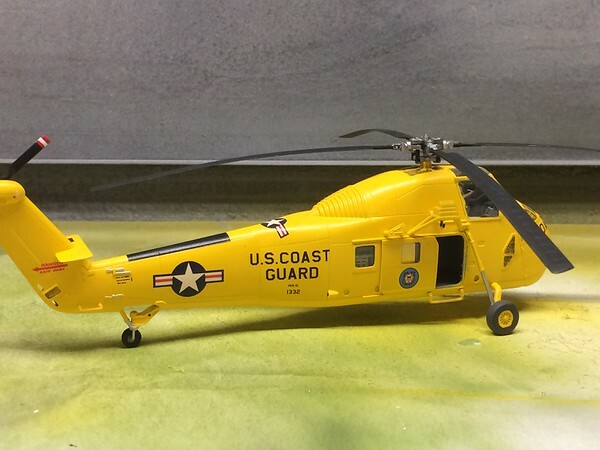 Thge CG flew these helo's for close to 30 years and the model can be painted in four different color schemes spanning this time period. I took a couple of "rides" in the "62", they were noisy and shook a lot but I enjoyed every trip, they were great machines. Your right about not seeing HH-62 all that much . 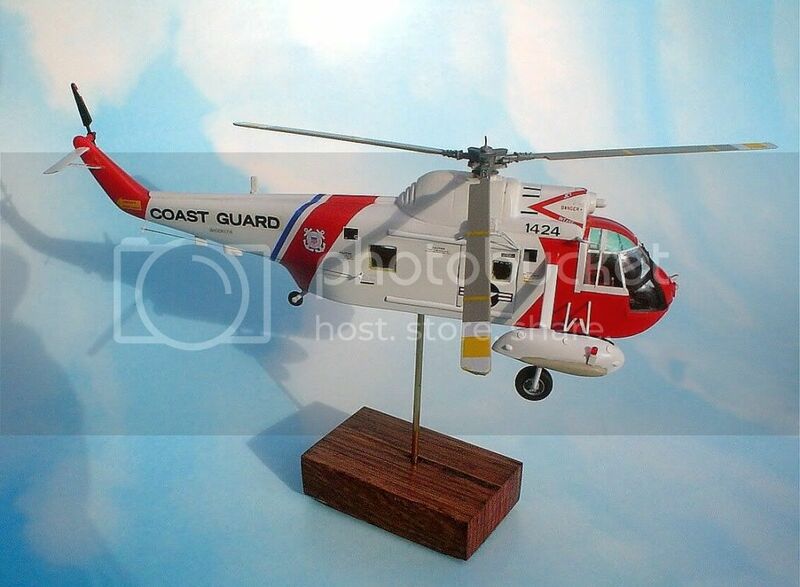 May I ask where you bought the resin kit , I would very much like to build a HH-62 for my helicopter / USCG collection as well . It was purchased direct from Unicraft models(Google the name and the address should pop up). 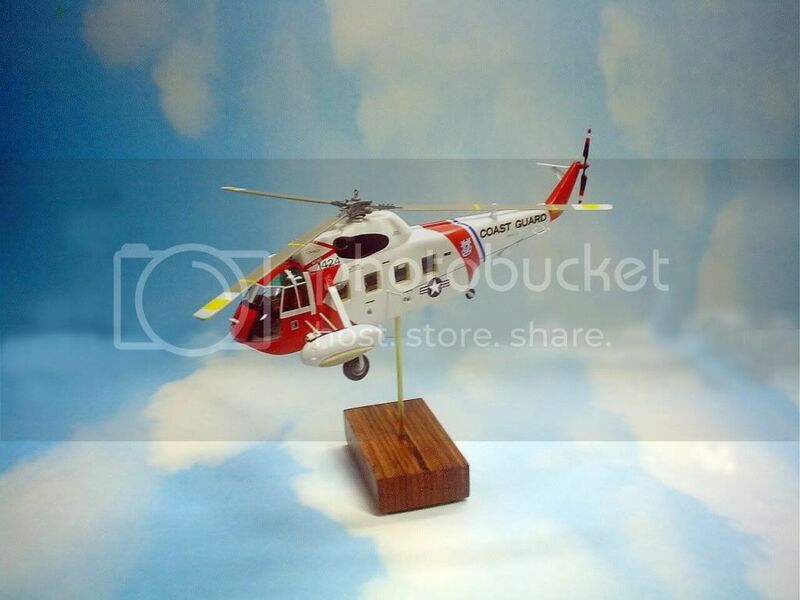 Unicraft, as you may know, offers a wide variety of unusual aircraft in resin. 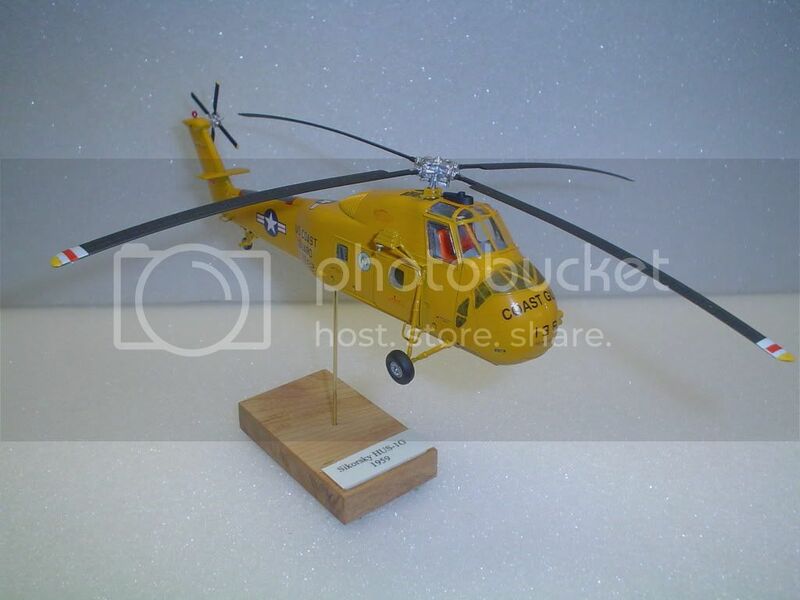 I note that they are producing another CG helo, the "Flying Banana" , hope to purchase one soon. 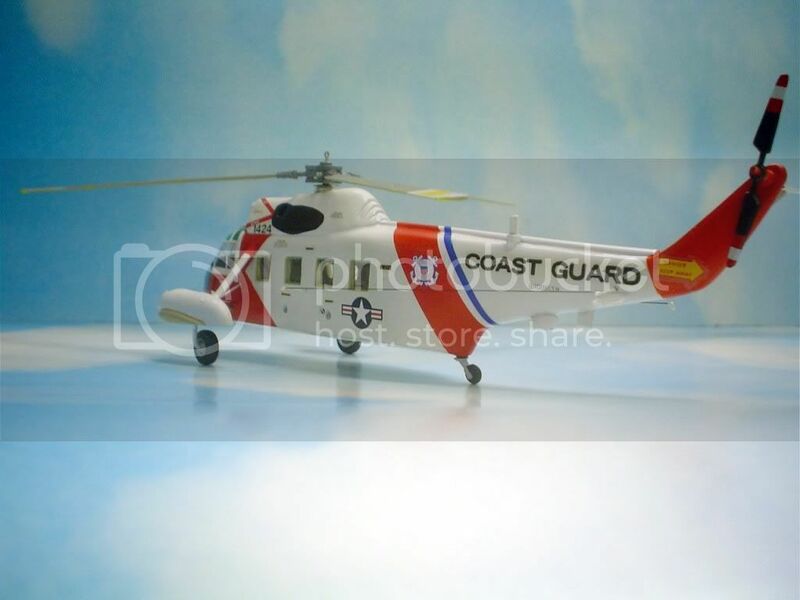 By the way, Sikorsky referred to this helo as the "H-62" but the USCG called it the "HH-52", boy am I losing it! Talking to the older guys, they loved that aircraft. Along with the HH-3F that is considered the golden era of rotary aviation. I'm not not sure about flying in a 52 though. single engine in the goo, no radar.I feel pretty comfortable in the safety of my MH-60T. Blessed are we with modern avionics and glass cockpits! I just ordered my S-62/HH-52 and I look forward to it arriving early in the New Year . I have an unfinished HH-3F Pelican build under the bench , it was the 1/72 Lindberg HH-3E kit . I cut the cockpit section off and grafted a Revell Seaking cockpit front section on as well as the recessed rotor housing ; It was a lot of work kit bashing the HH-3E , so I dug her out last night and will start masking the canopy and finally get around to painting her . Both the HH-52 and the HH-3F should look great sitting next to each other . Thank's again for the link . Indeed. It makes a current Coast Guard hoist operator weep. I just purchased the lindberg kit. Only thing i was going to add was the FOD cover and a radome. How much of a difference did the seaking nose affect the sub assy? I recently used the old 1/72 Revell Jolly Green Giant kit to build my HH-3E, didn't have to graft a new nose or rotor housing onto it, and used one of the fuel tanks to make the radome. Also pirated the main rotor & winch from an old MPC Sea King then changed the side windows & added scratchbuilt items to the fuselage & cockpit to complete the build. It was a fun conversion, and will soon be ready for paint. 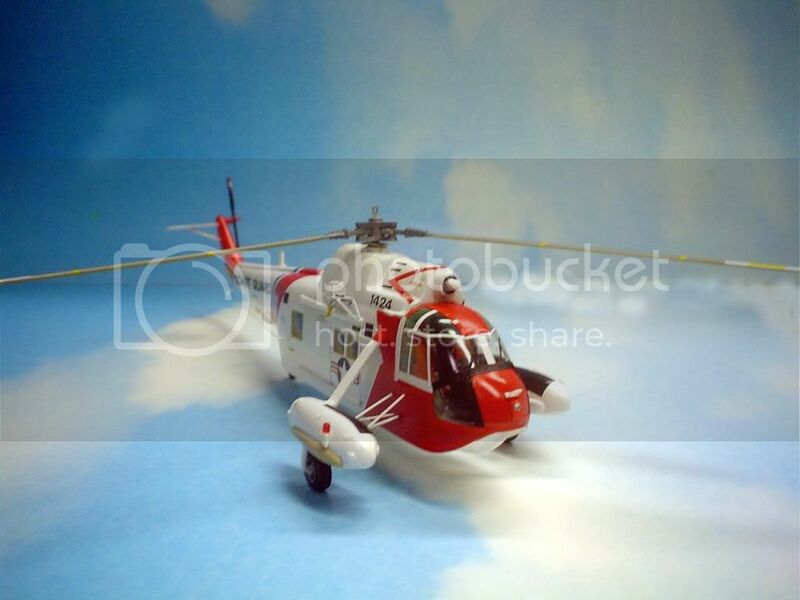 Have any suggestion for the USCG red-orange color? I usually paint w/ Model Master enamels. I'll soon be building 1/72 USCG Albatross, C-130, & a Jayhawk, all because I really like the paint scheme, & live near USCG Air Station Cape Cod. "The difficult, I do right away. The impossible will take a little longer." 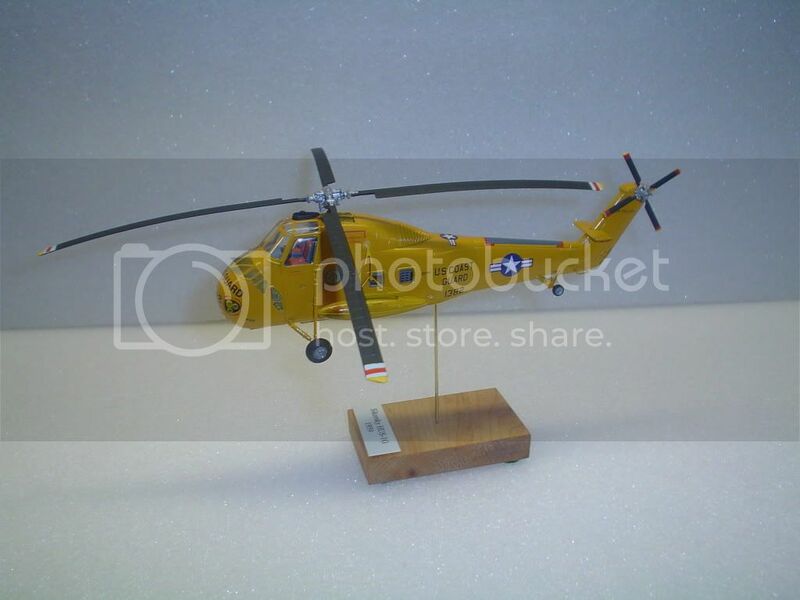 This was my second Linberg / Revell kit bash of the HH-3E ; I did the same conversion for a Vietnam HH-3E . The Revell front cockpit section was slightly smaller in width than the Linberg fuselage but it fitted together okay . I have 6 more Lindberg HH-3E kits in the stash but I won't be kit-bashing them to the same extent as the two previous builds , I'll just try and improve the cockpit interior and add a rear cabin floor and cut open the side door . Here's my copy of the Revell H-3. 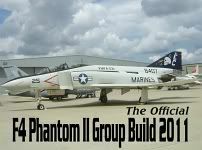 I haven't built a Jayhawk yet in 1:72 for my collection, it's on my list for next year. I took a couple of short hops on the H-3, noisy like the 52 but spacious in the interior, more so than the Jayhawk. My respect to the CG aircrews that fly these things into the soup, I prefer a steel deck under my feet on a SAR case. If you havent done so already, i highly recommend picking up the hobbyboss kit. the fit is nice and scratch building some antennas will be required, but overall its a great kit. Another Awesome H-3 USCG build Mike . I don't suppose you might have have built a HUS-1G (H-34) Coast Guard bird , with an external tank fitted . I've been trying to figure out for ages how to mount a external tank on my HUS-1G as well as a CIA "Air America" S-58T and an upcoming LH-34 /HUS-1L Antartic Sea Horse ??? Thanks for the nice compliment on the H-3. I built this HUS 1G so long ago I forgot how I attached the external tank , I recall I built a frame from brass rod, I wish I had a better picture. I think I used a photo from a book on CG aviation as a guide. The Coast Guard has a lot of aircraft sites to use for research thank goodness for the internet! You should have seen the "stuff" I built back in the day with no computers. 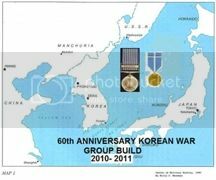 Try the USCG home page, historian department, I believe there are pics of helos. Good luck. On the site there are pics of this kit that shows with and without a cockpit and windows. What do you get with the kit? Regarding the HH-52, the kit comes with a vacuform canopy and a piece of clear plastic for the windows. I always use Testors Clear Parts Glue in lieu of clear plastic. It's a little tricky to work with making windows, portholes are a little easier. I have also used Micro Crystle Clear as another means of putting "glass" in model aiorcraft. Thanks! I may have to grab one while these are still available. I grew up watching these in Kodiak AK as a kid. I'd like to pick your brain about hoisting in an H-3! I found an outfit in the UK- http://air-graphics.co.uk/ They have resin conversion for a HH-65C, and a correction set for the HH-65 doghouse. They also have a set to convert the HH-3E to a Pelican. The -3F set includes a hoist, a FOD cover, the radome, floatation bags for the sponsons, and a 5-bladed tail rotor. I ordered both HH-65 sets and the Pelican set. They look nice, but I haven’t test-fitted anything yet. 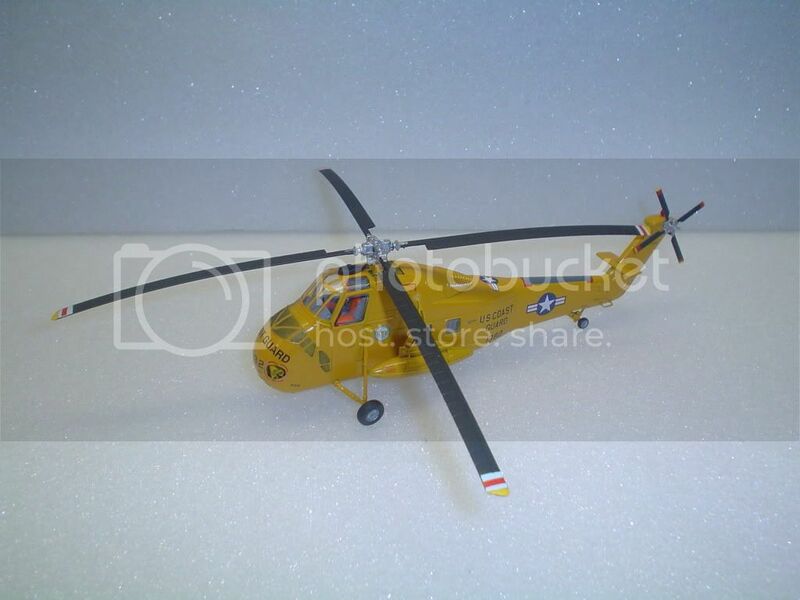 I also own the Unicraft HH-52 kit - got mine on eBay. Haven’t gotten the nerve to start it yet- it will be my first resin kit. Finally, I built the Hobby Boss H-34G as an AIRSTA New Orleans bird from 1960. The HB kit is OK, but the Italeri kit looks to have better molding. Someone used to make a little resin set for the extra fuel tank, but I think it is long OOP now. I started to make mine using a spare drop tank from the scrap box, but never came up with a decent mount. So I display my model “Starboard side to”...! Update: Found another great vendor: Whirlybird in the UK. They offer the external tank and fittings for the H-34G in 1/72.